With the Senate confirmation of Elena Kagan’s nomination to the Supreme Court, she joins an institution that for the public is largely out of sight and out of mind. While legal scholars analyze Kagan’s possible impact on the “Roberts court,” most Americans have no idea who “Roberts” is. 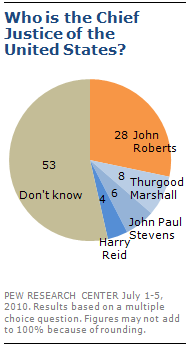 In Pew Research’s latest political knowledge quiz, just 28% correctly identified John Roberts as chief justice — from a list that included Harry Reid, Thurgood Marshall and John Paul Stevens. Much of the recent debate over the court has centered on whether it has become more conservative since 2006, when Samuel Alito replaced Sandra Day O’Connor. However, the public sees the court moving in the opposite direction. Currently, as many Americans say the court is conservative as say it is liberal (23% each); in July 2007 more than twice as many viewed the court as conservative than viewed it as liberal (36% vs. 14%). The public often has little to go on when making judgments about the court and its ideology. The Supreme Court’s workings are largely hidden from the public’s view; its proceedings are not televised, and sitting justices seldom give interviews. President Obama cast a rare spotlight on the court in his State of the Union address when he condemned the court’s decision allowing corporate spending in elections; Roberts later took the unusual step of publicly criticizing the president’s broadside. Such high-profile incidents involving court decisions are few and far between. As a result, the little that the public learns about the court often comes from the confirmation of new justices. The increasing perception of the court as liberal may partly stem from the fact that the court’s most recent nominees — Kagan and Sonia Sotomayor — were selected by a Democratic president. Republicans, in particular, see the court as more liberal and less conservative than they did three years ago. 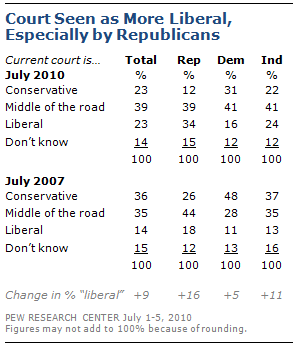 The proportion of Republicans saying the current court is liberal has nearly doubled since 2007, from 18% to 34%. Yet even the confirmation process does not register widely with the public. Shortly after Obama nominated Kagan to the court in May, Pew Research’s weekly News Interest Index found that most Americans (57%) had learned little or nothing about Kagan. Sotomayor, the first Hispanic nominee to the Supreme Court, had a somewhat greater impact. Still, 49% said they had learned little or nothing about Sotomayor shortly after her nomination last year, although she received nearly twice as much news coverage as Kagan, according to Pew Research Center’s Project for Excellence in Journalism. There is no public consensus on whether Kagan should be confirmed, and many offer no opinion on the question. A Congressional Connection Poll conducted in June by the Pew Research Center and National Journal, sponsored by SHRM, found that 33% said the Senate should confirm Kagan, while 25% opposed her confirmation; 42% offered no opinion. The large percentage expressing no opinion was not unusual: Before Alito’s Senate hearings in 2006, 48% had no opinion about whether he should be confirmed. While Sotomayor was more visible than other recent nominees, 25% expressed no opinion about her confirmation. Similarly, the Supreme Court’s decisions typically do not draw a great deal of public interest. In early February, just 19% said they heard a lot about the Supreme Court’s decision on corporate campaign contributions. Fully 68% disapproved of that decision, Citizens United v. Federal Election Commission, while just 17% approved. Even the public’s reaction to the Supreme Court’s 2000 ruling in Bush v. Gore — arguably the most important decision in a generation — was somewhat muted. During the week of Dec. 8-14, 2000 — the court’s decision was handed down Dec. 12 — 34% of the public followed news about the election outcome very closely. And the court’s decision was not the most closely followed news story of 2000. Significantly more Americans paid very close attention to the rising price of gas (61%) and the terrorist attack on the USS Cole (44%). In the wake of that ruling, which halted the Florida recount and handed the election to George W. Bush, positive views of the Supreme Court among Democrats declined. Still, in January 2001, just a month after the decision, 61% of Democrats expressed a favorable opinion of the Supreme Court, while only about half as many (29%) had an unfavorable opinion. Over the course of George W. Bush’s two terms in office, Democratic ratings of the court remained lower than Republican ratings, and lower than they had been following Bill Clinton’s nominations of Ruth Bader Ginsburg and Stephen Breyer to the court (in December of 1997, 81% of Democrats had a favorable impression of the Supreme Court). Following Barack Obama’s two nominations to the Supreme Court, partisan impressions have shifted again. Over the past year, Republican views of the Supreme Court have become more negative. Currently, 52% of Republicans give the court a favorable rating, while 28% view it unfavorably. Republican favorability is down from 70% in April 2009 — a month prior to Sotomayor’s nomination — and 80% in April 2008 in the last year of Bush’s presidency. As a result, for the first time since the Clinton administration, more Democrats (65%) than Republicans (52%) have a favorable impression of the court. Although recent views of the court have tracked with the party of the administration, the Supreme Court’s overall public image has been consistently positive for a quarter century in Pew Research Center surveys. With the public’s views of the federal government and Congress in deeply negative territory, the court’s 58% overall favorable rating stands out as even more of an exception. “Well Known: Twitter; Little Known: John Roberts,” July 15, 2010. 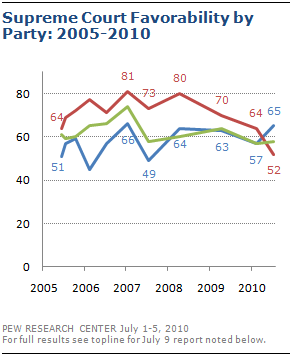 “Republicans Less Positive Toward Supreme Court,” July 9, 2010.